Mr Fletche and I tried Purecraft Bar & Kitchen for the first time as part of our “try-new-places-February” (not officially a thing). We’re huge fans of the Purity brand and it’s something of a different concept to find a restaurant so dedicated on matching their beer and food perfectly. We had no problems getting a table for two at 7pm but it was much busier when we left so go early if you can. The beer menu is the same size at the food menu, with probably more choices. It’s not quite the catalogue you get in Belgian pubs but there’s plenty of choice and good clear descriptions. We started out with old favourites Lawless for Mr Fletche and Gold for me, but we later went on to order a flight – 4 x 1/3 glasses which allowed us to sample three new beers (and a cider). I had the Lawless-battered fish and chips, whilst Mr Fletche opted for the BBQ chicken, Whilst the food was good, and there was plenty of it, I didn’t feel that it was worth the price, and wasn’t anything any more special than we could have picked up for half the cost elsewhere. I’m also not a fan of food served in those little plastic red baskets, but that’s just me (Rub, Buffalo & Rye, Purecraft…do they all get their little red baskets from the same stockist?) I wouldn’t necessarily go back there for a main meal again but definitely for more beer. It’s been a while since we sampled a new Sunday roast, so we decided to amble on over to Kings Heath to try out Kitchen Garden Cafe. You squeeze down an alleyway which makes you think you’ve stumbled into the garden section of B&Q, and there at the bottom is this lovely little, fairylight-bedecked cafe. There’s a fair coffee, tea and cake selection, and an extensive breakfast/brunch/lunch menu which seemed to cater to most tastes. The Sunday Roasts at £12+ are a little expensive compared to the other options, but you do get an extremely generous portion – a little too generous as neither of us could finish. Maybe a “smaller plate” option could be introduced? The honey roasted vegetables and startlingly green broccoli were perfectly cooked, as was the red cabbage, and my gammon was succulent and fat-free. Mr Fletche’s lamb chops were a little undercooked but still tasty. I’d certainly like to return to sample the brunch options as the service was friendly and efficient, and its a great venue tucked away from the charity shops and chains on the high street. Mr Fletche turned his hand to street photography this month, with a masterclass given by Kris Askey in collaboration with IgersBirmingham. Whilst a departure from his normal stuff – where humans don’t usually figure – it was a good chance to try something a bit different. Check out the instagram hashtag #igb_meet_street for more pics! The family party. The slightly limp looking buffet consisting of grey sausage rolls that have barely seen the inside of an oven. A conspicuous absence of anything that looks like salad. Sandwiches with indeterminate fillings.Which is how four of us end up scouring Google for a Chinese Restaurant open at 10pm which doesn’t require a booking, somewhere in South Birmingham. China Garden in Hall Green is the lucky recipient of our custom. They are busy, but not so much that they can’t set us up with a table for four. The set menu looks tempting but mindful that there will probably be too much food we settle for a selection of starters and main courses. Ma Lee is predictable and opts for yuk sung and chicken curry. She also gamely perseveres with the chopsticks after an initial reluctance. All the dishes are full of flavour and perfectly cooked. We are most impressed with the service and atmosphere though. The staff were all extremely warm, friendly and attentive without being overbearing. It’s unusual for us to go out for a Chinese meal but with China Garden practically on our doorstep we’ll definitely return. Time for Mr Fletche’s Christmas Present. The evergreen “Pop Kids” themselves, Pet Shop Boys, played at the Barclaycard Arena (does anyone else still call it the NIA?) and we settled down for an evening of 80s electronica, an impressive light and laser show, and an ever-changing display of bonkers headgear. When you have such a huge back catalogue and have been going for 35 years it’s inevitable that the crowd want to hear the hits more than the new stuff, which led the audience enthusiasm to dip a little in the first part of the show, but it was the holy trinity of Its a Sin, Left to my Own Devices and Go West which really got the crowd going, followed by Domino Dancing and Always on my Mind for an encore. Great night and a largely upbeat show, showcasing both the old and the new Pet Shop Boys. We make a brief sojourn into the Jewellery Quarter to check out the newly displayed photos by Mr Fletche at the Brown Lion, but first – lunch. Mr Fletche is slightly under the weather so a full-on Sunday roast is out; instead we head to The Pig & Tail where we can select small dishes to share. I love The Pig & Tail; this is the second time we’ve eaten here and it’s a lovely, colourful bar with huge windows letting in the light. They do a Sunday Roast menu, and a full brunch menu, but we went for the small plate option this time round. We opt for the spiced pulled lamb flat bread; rare breed pork, paprika & garlic sausages panko breaded fish goujons; and house fries with garlic mayo & bacon bits. Everything was delicious and we soon polished everything off, leaving us satisfied but not stuffed. Came to just under £30 with 2 drinks. It’s a quick drive round the corner to The Brown Lion. This newly refurbished pub is trying to build up a clientele and attract customers away from their neighbours with regular live music nights. They are also eager to support local talent and creatives, from furniture to artwork, and they approached Mr Fletche earlier this year after seeing his Birmingham photos on social media. The chance to display photographs in an up-and-coming pub in one of our favourite areas of the city? Yes please! 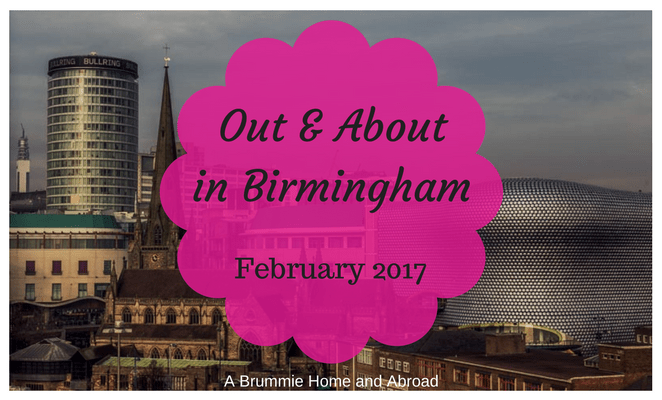 Where have you been in Birmingham this month? What should be on my list for March and April? You can see more of Mr Fletche’s work – aka CPF Photography on his website, and on Instagram, or give him a follow on Facebook and Twitter. "What has travel taught me? #Travellessons"
"Sssh..it's a secret! Three hidden gems to put on your travel list"
The ‘Like’ button has disappeared, otherwise I would have clicked on it.